By today's standards of media probe used for Ramdev's wealth and promotion of his message, Buddha would have gone down in history as a billionaire and a Thug! Ashoka was a valiant warrior and a terrible foe. But in 260 BC, he met Buddha after the Kalinga War, where many thousands were killed. And that chance meeting changed Ashoka forever. Not just Ashoka, but the entire South Asia, and indeed the mankind. Those days, there were no corporations. There weren't any Corporate laws or Audits. In that informal time, Ashoka unleashed his entire state machinery and his state wealth, apart from his family and his people - to go around the world and spread Buddha's message. Buddha accepted this gift of Ashoka as a necessary tool to sow a seed of Spiritual Awakening in the masses. Gautama, the Buddha was also very certain that He himself would lead his Sangha (or Congregation) and despite numerous attempts by Devadutta to push Gautama off as the leader of the Sangha, Gautama did not relent. Buddha remained the leader of his Sangha - and with Ashoka's patronage and wealth, the Sangha promoted and spread the Buddha's word far and wide. Had this episode occured today - Ashoka would have created a corporation or a Non-Profit and would have put in Billions to do the marketing and promotion, with Buddha being the leader of that Non-Profit. The terms, the semantics, the laws and the tools were different at Buddha's time, but the central work would have been done the same way. Devadutta tried each and every way to bring Gautama down from the helm of his Sangha. Every way and method was used - including proposition for extra restrictions on the vinaya (one of the two pillars of Buddha's teachings - Dharma - or law / doctrine - and Vinaya - or discipline - are the two pillars). Devadutta also tried to create a breakaway group and took some of the Sangha members with him, but even they were brought back. No matter what Devadutta tried, Gautama, the Buddha did not relent in his leadership of the Sangha and nor did he let his teachings be influenced by someone else. The reason why Buddha is spiritually important, and indeed critical is because he had at one time over 10,000 Enlightened disciples. A feat, rarely ever touched. But he also had the patronage of an entire empire. Let's move on to Nanak. Baba Nanak - or Guru Nanak Dev - was no ordinary being. He had hardly much education, but he was an awakened being who articulated the ultimate truth with remarkable clarity. While he travelled from Iran to Assam, Kazakhastan to Ceylon, Mecca to Kyrgystan, his family was being taken care of by Muslim noble and landlord - Rai Bular Bhatti, one of Nanak's earliest devotees. His travels were financed by Bhullar and other devotees. Although he had no formal organization to accept donations and grants, but he and his family were, nevertheless, the beneficiaries. Many brought jewels at his feet, which he didn't accept. But he did accept money to survive himself, promote his word by way of travels and also upkeep his family. In all, he traveled on his journeys - called Udasis, for almost half of his entire lifetime. When it came to Spiritual matters, Nanak was firm and direct. There was no ambiguity. Clarity of thought is the first sign of enlightenment. And Nanak showed that in abundance. He articulated it with love and compassion but with relentless honesty. Just as other Enlightened men and women before and after him, he did not have any political speak. There was no one to please and no one to make an enemy of. In such times, many tried to target Nanak and many did go to lot of extent even putting him in the jail. Had today's media standards of targeting Ramdev been used in Nanak's case, he would have gone down in history as a Family deserter at worst and a Landlord by proxy at best. To understand the link between Spirituality and Wealth, and to properly perceive the connection - lack of it, actually - between the two, it is important and instructive to go through the story of Gautama, the Buddha again. Buddha was an amazing student. Whichever school he tried, he left no stone unturned. No one could ever say that he didn't try enough when it came to Sadhna. In the end, he went through a Tap, where he was surviving on one grain of rice for days. He was weak and without strength. He was crossing a weak stream and was taken away by the water. Somehow he managed to come out. By that time, he had managed LOTS of followers, who also believed that a weak, poor man in tatters is also a spiritual man. That night as he sat under the tree with no hope in life or thereafter but with determination to just over "with it", he was enlightened. The first thing he did after that was have a hearty meal and he enjoyed it as he ate it. Seeing this, many of his followers - who believed that living in tatters is the height of Spirituality - ran away. "How could he eat so much AND enjoy?!" was their refrain. That's the tragedy of Spirituality. The "principles" of Spiritual "behavior" are NOT set by the enlightened, but by Spiritual idiots. Only those who aren't monks or Yogis themselves are the ones who take it upon themselves to lay down how a Monk or a Yogi should behave! Ironically, outside of the Spiritual world, in every other arena of life, the practitioners themselves set the rules and principles for themselves. But not so for the Monks and Yogis, and the Enlightened. It is done by people who have never travelled on that road. In Baba Ramdev's episode, the arguments against him are interesting in nature and expose the mindset that besets a "believer" of a religion or a politician who is on a witch hunt. The less said about the latter the better. Of the former - when someone has never made effort to exert himself or herself to understand the underlying truths on the Spiritual Path, then that same rigor will be taken everywhere he/she goes. Every where s/he presents any thoughts, they will have the same level of intellectual rigor and effort. "Ramdev is a thug because he has a lot of money abroad": The organization / trust he has is the one which has invested in those properties via the donations given by various followers or beneficiaries of his work. If one thinks back to the Buddha days, for thousands of Stupas built all over the South Asian land mass, money spent for the artisans and the raw material would have been in millions by the yardstick of that time. Can one safely say, using the same argument, that since the Sangha of Buddha - leadership of which he so fervently safeguarded - was the beneficiary of that money, Buddha - as the person at the helm was a thug? And like Ramdev, all that construction was also done abroad. Ramdev, of course, has a slight advantage over Buddha. The Buddha had a family. Ramdev has none. So, even if he makes money, it will be for himself. "Ramdev hasn't given his accounts openly, so how can he ask politicians to come clean? 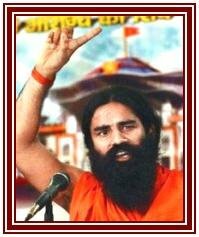 ": First thing first, If Ramdev's accounts are not upto the mark, it won't make much of a difference to you or me. But if Rs 400 lakh crores (USD 9.09 Trillion) don't come back and many more are stashed out that will make a HUGE difference to the country's economic future! Just as a reference, United States' total debt is Rs 650 lakh crores! Second, Ramdev's trust is a Private Trust and not a Public Limited Company. So, he does give out the accounts but not in public - but to the tax authorities. That is the law. There is no reason why he should do otherwise. Instead of making up stories based on an action in line with the legal practice, it may be more worthwhile to actually go to the tax authorities and ask for the accounts via an RTI (RIght to Information) plea. Third, with the kind of passion with which the Government and the adminstration is targeting Ramdev, can any intelligent person believe that if his accounts weren't up to the mark, he would have survived? Is it even reasonable or logical? "Ramdev should only teach Yoga and not talk of Politics or Social Ills": Arundhati Roy is a fiction writer, award winning, but a story writer nevertheless. But over the past few years she has been eulogized as a champion for causes ranging from Kashmir to Dams to Nukes. Kapil Sibal, on the forefront of the gang to hit Ramdev is a lawyer. But he is a Human Resource Minister and talks freely of what is right or wrong about Indian Institutes of Technology (IITs) and the Indian Institutes of Management (IIMs). Maybe I wasn't listening, but one didn't hear much complaint from anywhere. So, why the change in standards now? And, moreover, he is a citizen and a tax payer. Where the money he pays as taxes goes is his concern as well! As much as any other citizen's. No matter what you do, you can talk about how your money is used by your representative. Five national myths and the reality!